Preheat oven to 180°C (350°F). Heat the cream in a medium saucepan over medium heat until it just comes to the boil. Remove from the heat and set aside. Place the eggs, sugar and vanilla in a bowl and whisk to combine. Gradually add the cream, whisking until well combined. Set aside. 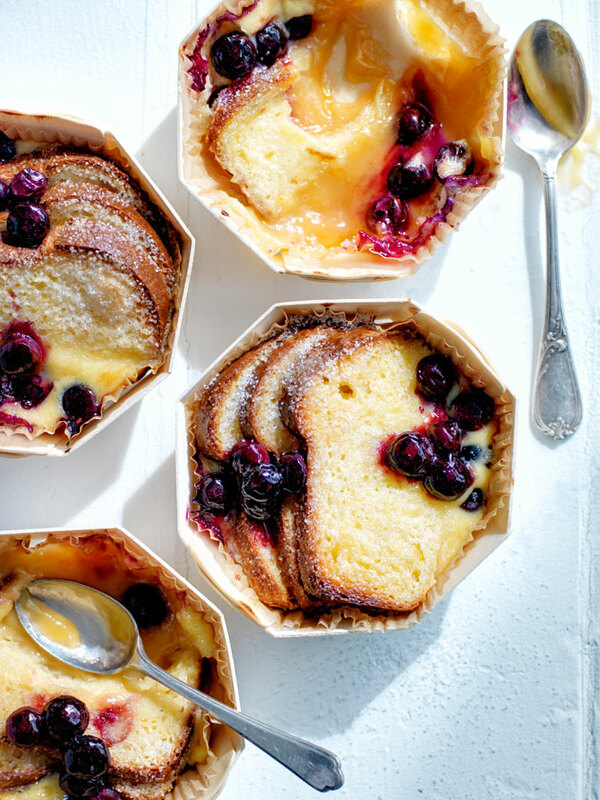 Spoon ¼ cup of the lemon curd into each of 6 x 1-cup-capacity (250ml) round baking dishes lined with non-stick baking paper. Divide the brioche between the dishes and pour over the cream mixture. Top with the blueberries and sprinkle with the white sugar. Place the dishes on a baking tray and allow to stand for 5–10 minutes. Bake for 15–20 minutes or until golden and set. Allow to stand for 10 minutes. Makes 6.
tip: You can use any type of bread in this recipe, from simple soft white bread or fruit loaf to panettone or croissants. It’s often better if the bread is a day or two old.